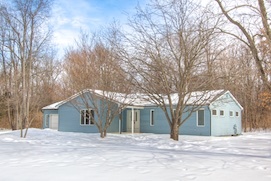 This well maintained ranch on a private wooded lot is located close to the charming town of Dexter, Michigan. This ranch features a very open floor plan, with beautiful hardwood flooring and an open kitchen, the feel is mid-century, the the home is much newer! The great room is open bright and has access to the fenced back yard and patio through large sliding glass doors. 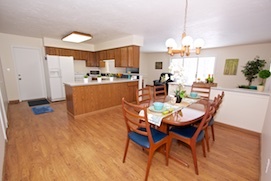 The dining area is open to the kitchen and is also very spacious. The kitchen has plenty of cabinetry, a breakfast bar and Corian counter tops. A large study would be perfect for someone working from home, with tons of built-in book shelves and cabinets. The master suite features a wall of closets, and a private master bath. Two additional bedrooms also have lots of storage and are bright and sunny. The full basement has plenty of room for storage and is partially finished. A two car attached garage, is such a luxury, and provides extra storage space. This home is just 20 minutes from downtown Ann Arbor. Make an appointment to see this piece of Dexter real estate and you will be glad you did!